Back from Nepal so no further Culture Crime News delays for the time being. Please let me know if I have missed any topical stories in any language. I am sure no one is surprised that those comments aren’t playing well. There are a lot of reasons, only some of them ‘collecting’ related. Is Barry Clifford a looter or is he a “private-sector archaeologist” (…sure, and I am a private sector brain surgeon). Either way he claims UNESCO is out to get him. Very few details. Images of the Virgin and other items were stolen from the church of San Pio X in Formosa. The sacred meteorite was taken from First Nations in Alberta 150 years ago as part of forced conversion. Bishop of Cuernavaca says he does not fear sacred art theft investigation following allegations of wrong doing because he claims no art has been stolen. The INAH is encouraging the public to bring them reports of fossil looting as they want to pursue such cases. Oh boy. This guy in charge of anything is a threat to heritage if I’ve ever seen one. For shame. The man pled guilty for transporting the 4 works from new Hampshire to California where they were sold to a pawn shop for $100k. A 5th Wyeth painting stolen from the same owner is still missing. More on the cross country investigation into the transport and sale of several stolen Wyeths. Stephen Reed is accused of diverting public money to buy thousands of artefacts for a museums that were not built and that he kept in his personal offices. 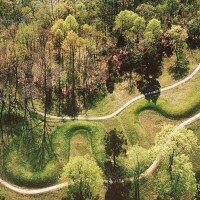 The man who took a joy ride over a burial mound at Serpent Mound will have to pay a fine and produce a research paper on the site’s history. You can’t yell fire in a crowded theatre and call it art. More on the performance art bank robberies of Joe Gibbons. He has been convicted for these thefts. The new regulation is slated to take a big swipe at the illicit antiquities trade. The market hates it. Focused on the art market losing money over draft German legislation that essentially classes art and antiquities as culturally valuable over financially valuable. Let’s talk about its potential to clean up the illicit market. Seemingly willful effort on the part of the art market to publicly misunderstand the purpose and focus of a new German law that would cut down on illicit antiquities trafficking. This isn’t the first time that Nosferatu director F.W. Murnau’s tomb has been broken into. The Jeep isn’t property of the museum but was parked there for an event when it was stolen. Metal detectorists, police, and antiquities experts met to discuss heritage crime in Sussex. Mostly lead is stolen from Chester’s churches, but so are musical instruments and religious artefacts. Please don’t sell artefacts as lead scrap. Please. The auction house was explicitly told they did not have permission to publish 4 Olsen works and did anyway. Cultural diplomacy: an agreement to prevent antiquities trafficking at the border comes with an agreement for a ‘border pass’ for workers on each side. The idols, stolen from a temple at Anupanadi, were found lying on a road near Avanipuram after a series of police tip offs. A gong was stolen from Nandeswar temple in Nandgram, however it has been recovered and a suspect arrested. The piece was sold by Subhash Kapoor. The latest in a string of Kapoor pieces to be returned. The idol of Shiva and Parvati in the David Owsley Museum of Art was bought 10 years ago from Subhash Kapoor. The museum anticipates they will be returning more Kapoor pieces. A crown was taken off the idol at the Mahamaya temple in Bhadaura. A parasol and other items were taken as well. Four statues were taken from the temple in Karimnagar. An overview of a talk on the theft of sacred art that I gave in Kathmandu. An interesting result in a tough case. The statues are Korean but were stolen from Japan by Koreans. In other words South Korea is returning a Korean item to Japan. Opinion piece that argues that since Japan is vocal about the return of two Korean pieces stolen from Japan (yes, typed that right), South Korea should be vocal about the return of looted Korean items in Japan. The museum’s automatic door is being held shut by a log. This is disturbing in light of other thefts from Sri Lanka’s museums. Where the US Ambassador to Iraq says there has been no tangible evidence for IS selling antiquities. Identities of those arrested have been kept secret but they are assumed to be right-wing extremists. They were left on the Beersheba museum’s doorstep with a note saying that the person stole them in 1995 and they brought nothing but trouble. Part of the wall of this 13th century structure was damaged by either rebel or government forces. Utrecht University PhD student Hüseyin Şen discovered the two manuscripts which were stolen from the Yusuf Ağa Manuscript Library in the collection of the University of Pennsylvania while researching birdhouses for his wife. These are properties confiscated in 1915. The article also mentions that a case against the Getty for illuminated manuscript pages is in negotiations. How did Gerald Ford end up in this family’s closet? More Philippine forest turtles than were thought to exist were recovered from smugglers.